Every once in a great while an artist emerges who does more than simply reflect the social trends of the time. These artists are able to transcend established thinking and help us redefine ourselves and our world. Today a growing number of art critics, philosophers, and spiritual seekers believe they have found that vision in the art of Alex Grey. 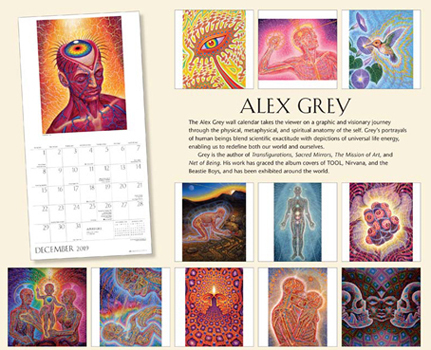 The Alex Grey wall calendar takes the viewer on a graphic, visionary journey through the physical, metaphysical, and spiritual anatomy of the self. Grey's portrayals of human beings blend scientific exactitude with depictions of universal life energy, leading us on the soul's journey from material-world encasement to the recovery of our divinely illuminated core. The perfect gift for the visionary art enthusiast. Showcases Grey's distinctive portrayals of human beings that blend scientific exactitude with depictions of universal life energy.